In this back country setting, the gorge-like landscape, exposed sandstone cliffs, and waterfalls provide a unique recreational area for the Midwest. 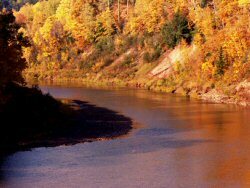 The river also has excellent fishing for resident brown trout, Lake Superior run salmon, and steelhead. Designated Reach: March 3, 1992. The East Branch from its origin to the Ottawa National Forest boundary. The Middle Branch from its origin to the northern boundary of the Ottawa National Forest. The Cisco Branch from its origin at Cisco Lake Dam to its confluence with Ten-Mile Creek south of Ewen. The West Branch from its confluence with Cascade Falls to Victoria Reservoir. Classification/Mileage: Wild -- 42.9 miles; Scenic -- 41.0 miles; Recreational -- 73.5 miles; Total -- 157.4 miles. This 24 mile stretch of the river begins with access on US-45 at the Military Hill Bridge with ample parking available. Three miles downstream a second landing site provides access at the Victoria Road gauging station. The river is canoeable throughout the summer with high water in the spring and fall providing the best canoeing for the more experienced canoeist. A boat landing at the Ontonagon Harbor is available near Lake Superior. Fish for brook, rainbow, and steelhead trout, northern, and walleye. Canoe access and parking is available at a Forest Service wayside in the town of Watersmeet where US-45 crosses the river. A portage is necessary at Mex-i-min-e fallswhich is approximately 9 miles down the river before Burned Dam campground. The rest of the trip to Bond Falls Flowage has moderate rapids and quiet pools for fishing. There are approximately 11 additional miles to Bond Falls Flowage. Just about any kind of native fish can be caught from the campground to Bond Falls Flowage. This 25.3 mile river stretch begins at the M-28 bridge in Ewen and ends at the Victoria Dam. These are the only available access sites. Rapids located within the last 2 miles can be very difficult during medium to high water. Photo courtesy of Tim Kiser. Sorry, We have no listings serving this river at this time.